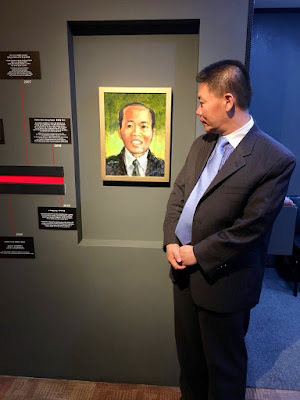 (Seoul, South Korea—June 2, 2018) ChinaAid President Bob Fu visited South Korea recently and spoke at several events orchestrated by Voice of the Martyrs Korea (VOMK), exposing the abuses of the Chinese Communist Party. On May 21, Fu, who was once a pastor in China’s underground house church network, shared his experiences regarding the Chinese church with a group of Korean Christians gathered at the VOMK office in Seoul, detailed the increased persecution of Christians under Chinese President Xi Jinping, and advised Korean Christians on how to combat these abuses. The next day, Fu updated Advocates Korea and alumni of the Handung Law School about the severity of China’s human rights abuses. On May 23, the VOMK office hosted its largest-ever press conference, which was attended by reporters representing nearly all of Korea’s Christian media as well as the major secular news source, the Korean Times. There, Fu delivered a eulogy for his friend, Christian human rights lawyer Li Baiguang, who died under mysterious circumstances after suffering repeated threats from Chinese government agents. The conference also addressed China’s lack of rule of law and the persecution of North Korean and Chinese Christians. ChinaAid uses these engagements as an opportunity to expose China’s abuses of Christians in order to uphold human rights, religious freedom, and rule of law.